After these two review copies, I will be caught up on reviews. Yay! Considering this first one was the book that finally interested me after the election last November, you will agree that I have been in a bit of a slump. It's nice to have the time and will to do some of the things I love again. 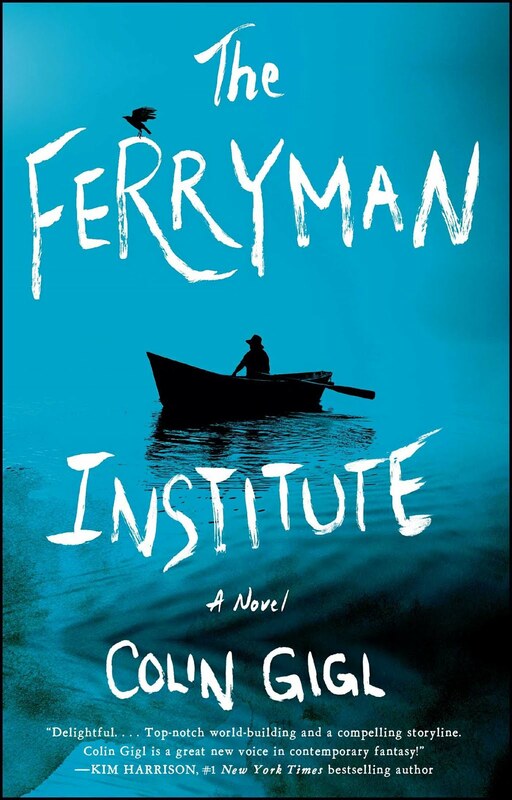 The Ferryman Institute by Colin Gigl was indeed the book that finally got me reading again after the shock and horrors of the election. I needed a true escape and I found it with Charlie Dawson, ferryman extraordinaire. Ferrymen are the ones who are there at the moment you die, meant to help you head to the afterlife. 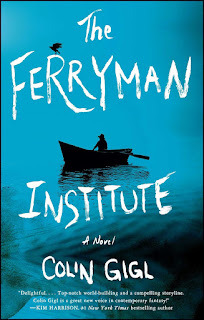 Charlie is the best at the Institute but the job has taken its toll on his sanity and he wants nothing more than to leave and rest. Then he gets a mysterious assignment where he is given a choice whether or not to save someone from suicide. His choice changes everything. I got so lost in this book. It was deep and dark, delving into hopelessness and depression, but beautiful. There are chase scenes but also long, thoughtful talks with friends. There's even a romance -- though I didn't find it very probable. It reminded me of a Georgette Heyer mystery where two people bicker non-stop through the entire novel and then VOILA, they are madly in love, with no logical reason why. But, as with Heyer's improbable couples, it didn't really affect my enjoyment of the book. I loved its quirkiness and heart and plan on rereading it at some point. 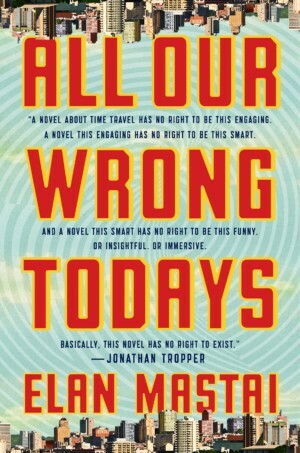 You've probably seen All Our Wrong Todays by Elan Mastai around. It has been getting a lot of press and publicity. It's a pretty basic story -- boy grows up in ideal future, loses his mom and best girl, messes with his dad's time machine, and inadvertently screws everything up, giving us, well, the "dystopian today" you and I are living now. He then has to decide whether to find a way to reset the future, restoring the people who ended up not existing in this timeline, or accepting the current timeline where his mom is still alive, his best girl is even better, and there's a sister who he is beginning to love. I've never heard of All our Wrongs Today but it sounds super fun! I don't need the ARC but I'll definitely grab the book at the library. I love time travel stories, especially when they legit get into the details and implications of time travel. I know. Connie Willis and Kage Baker are my favorites because of the depth of the mechanics. They convince me it could actually happen! It's definitely a fun escape. I hope you get to it!